Cuttings or “clones” are a popular method of propagating plants. A cutting is a plant part removed from a ‘donor’ or ‘mother’ plant that will develop roots and shoots when placed in a growing medium under favourable conditions. For many species, cuttings reach the vegetative stage faster than seedlings. Further, cuttings taken from the most recent growth will produce plants that take less time to reach biological maturity than cuttings taken from older growth. Commercial fruit growers use cuttings to minimise the lengthy non-fruiting phase associated with seed propagated plants. When artificial lighting is used, cuttings can be switched to flowering sooner by changing to the “redder” light spectrum of a HPS lamp. This is beneficial because the crop cycle is faster. Cuttings produce a plant having the same general genetic characteristics as the donor plant. For example, the same appearance, size and yield. The result with seeds can be more uncertain. The most appropriate cutting material will vary between plant species. However, most species can be propagated using 'stem cuttings'. 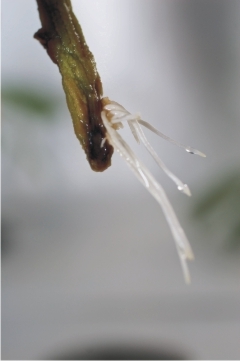 A stem cutting incorporates stems, leaves and buds (Fig 17.2). 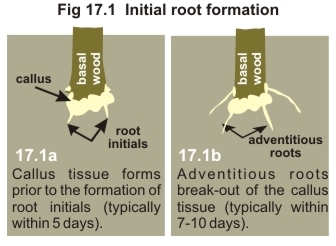 Roots grow from the basal wood (Fig 17.1) and shoots grow from the buds. Step 1. Thoroughly sterilize all the hardware that is likely to come in contact with the cuttings. Step 2. Pre-soak the growing medium (e.g. 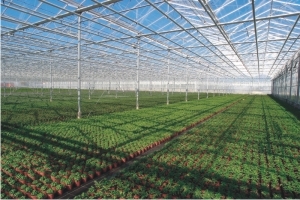 Rockwool) by immersing or drenching with a pH buffered seedling nutrient solution. This will help remove the excess ‘alkalinity’ that is often present in this material. Allow excess nutrient to drain. If using Rockwool, gently squeeze to remove the excess nutrient. Step 3. 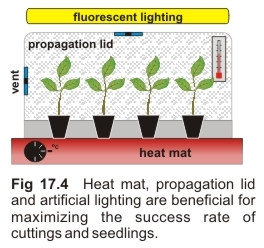 (Fig 17.4) To increase the success rate of cuttings, use a ‘heat mat’ and ‘propagation lid’ to maintain the root and air temperature at 20-25OC (68-77OF), and relative humidity at ~80% (see section on bottom heat below). Use “cool white” fluorescent lighting timed to run 18 hours per day. Ensure to establish this environment prior to planting cuttings. If cuttings are being grown outdoors, use a propagation lid and position in a partly shaded location. Too much light in the early stages can stress cuttings. Step 4. Select a plant that has been well maintained, has favourable characteristics and is free of disease. The cutting material must be of 'semi-hard' wood i.e. stem material that is no longer soft and supple like new growth. Avoid plants that are well into the flowering stage. Step 5. Using secateurs or a scalpel, remove a 'lateral' (side branch) that has at least 3 sets of leaves (Fig 17.2). Immediately place the cut end into lukewarm water. Step 6. Using a scalpel, trim the cuttings as per Fig 17.3a: (1) Remove the bottom set of leaves**; (2) Re-cut through the stem at a 45O angle below where the lowest set of leaves were. Large leaves should be cut in half if they tend to wilt during the first few days of planting. Step 7. Immediately immerse region (3) into cutting gel or powder (Fig 17.3a & 17.3b). Punch a snug hole in the medium, deep enough to accommodate region (3). Push the cutting right to the base of the pre-made hole then press the medium against the stem (Fig 17.3c). Step 8. Mist cuttings daily using water or a seedling foliar fertilizer. Water the medium as required using a bloom nutrient solution at EC 0.3-0.8mS (typically about one-third the normal strength). To avoid stem rot and disease, use an anti-fungal root drench and never allow the medium to remain waterlogged. Diligently remove any dead leaves or dead cuttings as these are an ideal host for fungi. Also, remove any floral buds that form. Step 9. Depending on the plant variety, roots usually develop within 7-10 days. Once this occurs, gradually expose the cuttings to their proposed environment. Be careful because a sudden change in humidity, nutrient strength, light intensity or temperature might kill them. Therefore, gradually increase the nutrient strength to that required for the vegetative phase - see Table 11.30. Initially remove the propagation lid for ~30 minute periods, 1-2 times per day. Then increase the frequency and duration over the course of a few days, or as required, until the cuttings are ready to be planted. **If the growing medium is sufficiently deep, it is possible to get better survival rates by having a second set of leaf “nodes” below the medium’s surface (Fig 17.3d). When planting, position these nodes ~5mm (1/5 inch) below the surface of the medium. Bottom heat is highly beneficial for 'cuttings' because it increases the respiration rate at the ‘cut’ end. The respiration rate is critical because it produces energy to form roots. Note, excessive air temperature is counter productive for root production in cuttings. It increases the rate of transpiration causing cell dehydration (i.e. there are no available roots to replace the water lost from leaves) and increased shoot growth, which depletes carbohydrate reserves. Therefore, avoid allowing the air temperature to exceed 25OC / 77OF.